The unique symphony generated on large construction sites is music to the ears of developers and construction managers, who interpret the banging, clanging and grinding of machinery as progress toward completion of their buildings. For anyone within earshot of a construction site, the high-decibel orchestra is a temporary inconvenience — necessary noise that signals growth and change. But for mammals and fish who experience the pulsating sound waves of marine construction, the effects can be life threatening. As federal laws protecting endangered underwater life have strengthened, engineers with the Washington State Department of Transportation have been asked for new solutions to mitigate the deadly acoustic effects of the biggest manmade underwater, near-shore construction culprit: pile drivers. This fall, they hope to finalize testing on an innovative method that will save the lives of fish and mammals in the Puget Sound region and beyond. 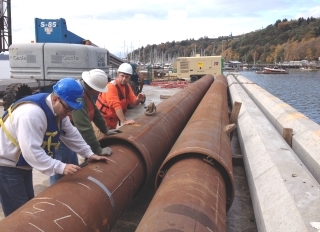 Fifteen years ago, the effects of pile driving on projects such as rebuilding ferry terminals became an emerging national problem, according to Rhonda Brooks, research director for WSDOT. 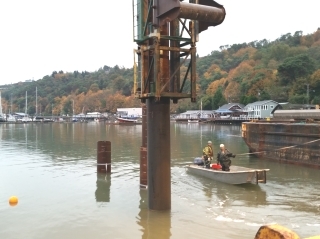 The Washington Department of Transportation and the National Oceanic and Atmospheric Association looked at the effects of bridge construction sites in California and British Columbia and became concerned about how pile drivers were affecting marine life. The initial studies in the early 2000s led to WSDOT’s decision to sponsor a local competition for solutions to mitigating the effects of sound waves on marine life, as WSDOT prepared to rebuild several ferry terminals. Brooks said contractors in prior years had attempted to address the issue by creating “bubble curtains.” Contractors slid a sleeve over the point where the hammer met the pile, and the impact created bubbles underwater that dampened the sound. But the bubble curtain method had its shortcomings. “It was a construction hassle to get the bubble curtain maneuvered around the piles and it took a lot of resources and monitoring by biologists bobbing around in boats to take sound measurements to see the decrease in sound,” she said. The 2005 proposal competition led Brooks and WSDOT to University of Washington mechanical engineering specialists Peter Dahl, a professor and senior principal engineer in the Acoustics Department, and Per Reinhall, a professor and Mechanical Engineering Department chair. Brooks said she quickly realized that WSDOT could tap into Dahl and Reinhall’s expertise. “When I first met them, it was like a light bulb went off,” she said. Nearly 10 years of testing culminated in the relatively simply solution of using a double-pile method: an outer pile serving as a noise shield, while only the inner pile is struck. The piles are joined by a special coupling shoe, and the noise reduction on average was found to be about 20 decibels. Further, researchers found that the double-pile method can be used with conventional techniques and equipment. To solve the issue, Reinhall said he first studied the underwater acoustic properties of pile driving. With the double-pile system, Reinhall said “the inside pile expands against the air (between the two piles) and not against the water.” He added that the coupling mechanism that joins the two piles in the “secret sauce” in the double-pile system. 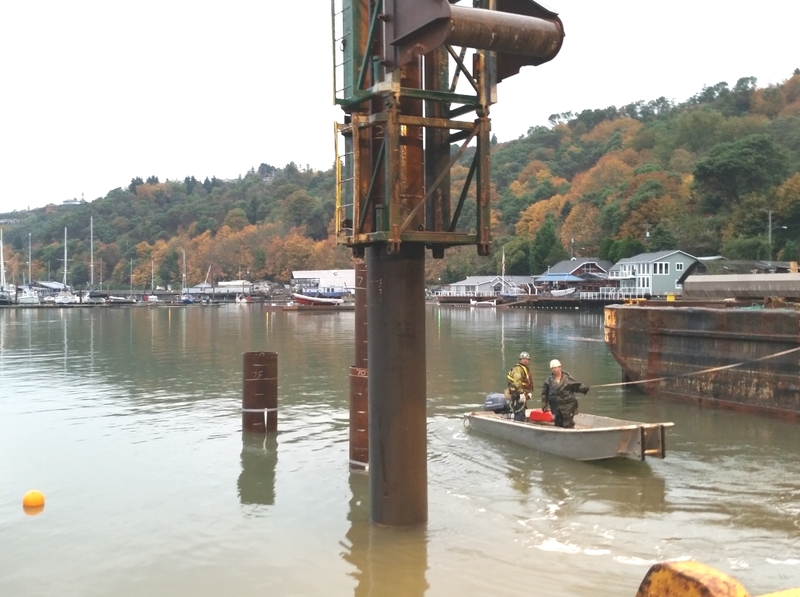 A major advantage that the double-pile system has, according to WSDOT studies, is that it can mitigate the reverberations of sound at the sediment level by burying the harmful noises; whereas the bubble curtain is strictly used in the water. WSDOT tested the double-pile system at its Port of Tacoma Commencement Bay terminal project last year, and will continue testing this fall and winter at a ferry terminal rebuilding project on Vashon Island. Brooks said she hopes this year’s testing on Vashon will continue to show positive results. “We hope this is the final test before it goes to market,” she said, referring to patenting the double-pile system for use around the United States and beyond. Reinhall said he and the UW have created a public benefits corporation called Marine Construction Technologies that will oversee the development and patenting of the double-pile system. Reinhall said the aquatic environment is a new venue for him to apply his expertise in acoustic engineering, though he added that he had worked on “heart valve blood interaction” engineering projects in the past. Reinhall said UW Ph.D. candidate Tim Dardis was instrumental in the development of the double-pile design.